The real reason for printing the knot 8_18 yesterday was to compare it to a print of 8_19, the first non-alternating knot in the standard knot table. Settings: The same MakerWare custom knot-slicing profile used yesterday. 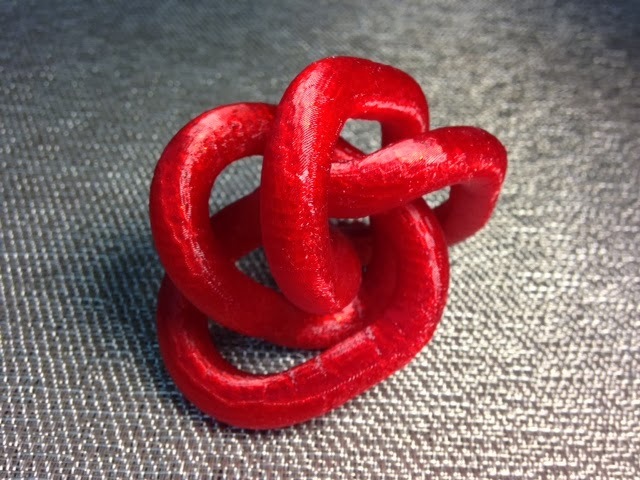 Technical notes: As always, this knot was made in Mathematica using Cantarella data. Compare this model of 8_19 with the 3D model of 8_18. Can we see something in this optimal 3D configuration of 8_19 that would suggest it has no alternating 2D projections?